The true test of advancement in any building project – be it a restoration or a new development – is material progress. Approval of planning applications and promises of commencement of work count for little presently. Take the Birdcage Bandstand for example. I personally recall fading posters on a rusting barrier a couple of years back with a promise of action by early 2006 – it was autumn 2006 at the time! Before the last local elections, Brighton & Hove City Council sought Lottery funding for the urgent works which never materialised. A different approach was taken by the new administration under the close eye of Councillor Geoffrey Theobald to take the project forward without further delay. The Bandstand was designed by Brighton’s Borough Surveyor, Philip Lockwood, in 1883 and built in front of Bedford Square the following year. It was Lockwood who, in 1867, converted the Dome in 1867 from stables into an assembly hall and Lockwood who, in 1873, remodelled the stables, coach houses and former royal servants’ quarters to the east of the Dome into a library museum and art gallery. He was also responsible for Madeira Terrace which was completed in 1890 running between the Aquarium and Duke’s Mound on the Kemp Town seafront. An octagon of ornate arched poles supports the Bandstand’s oriental dome. Bearing in mind that in 1910 there were eight bandstands in Brighton and Hove, it becoming Grade II Listed in 1971 must have come as a relief to many. I was hoping that the restoration would be dramatic but certainly was not expecting the entire structure to vanish – all the way to Leander Architectural’s foundry in the Peak District. Columns, arches and roof framework have been blasted back to the bare metal for repair and repainting. Much of the skeletal frame is now back in place though. The company is also busy making patterns for other broken and missing sections including gutters, friezes and balustrade posts. 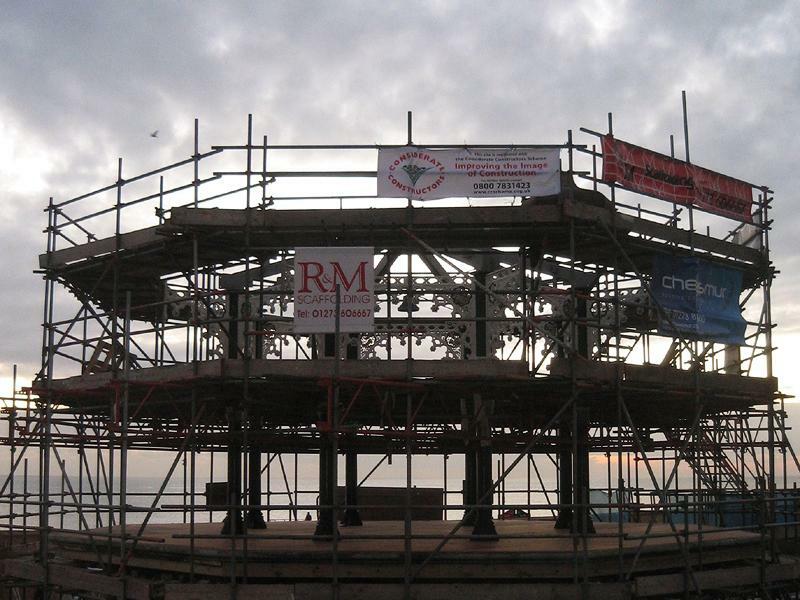 DRP Architects in Brighton and Cheesmur Building Contractors in Lewes as lead consultant and main building contractor respectively are working to return the Bandstand to its former glory. Even the bridge which connected it to the promenade is to be reinstated. The former public toilets below will become a café which many are keen to run including one local prolific Bandstand supporter, Meg Stone. 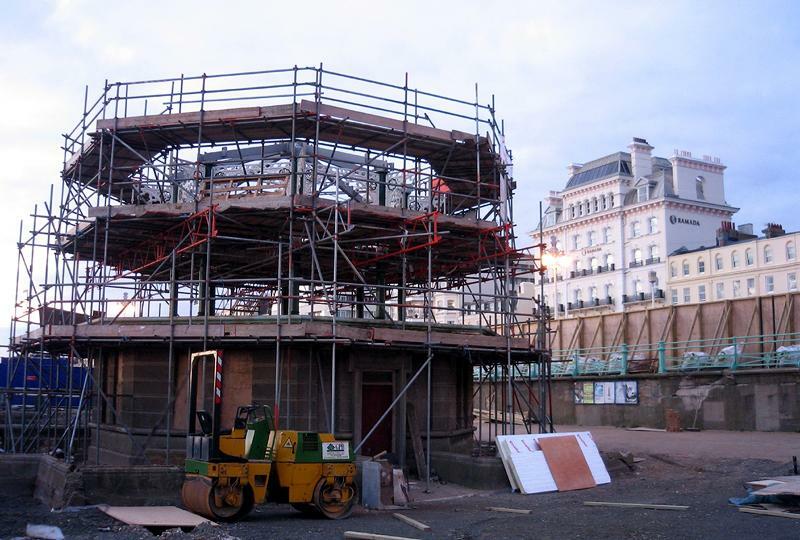 The project is due to be completed by the summer – see www.brightonbandstand.co.uk for details.